For our pioneering great-great-grandmothers who blazed trails throughout the unknown territories of bygone eras, tackling outdoor adventures in a skirt wasn’t a choice, it was a daily reality. No matter the conditions, no matter the temperature, no matter the task at hand, a skirt was the apparel of the day, even if that day including wading through a waist-high stream or herding escaped livestock. We tend to view the move away from skirts as one of escape and liberation—and, indeed, anyone who’s ever ridden side-saddle can attest to the benefits of pants—but there is a surprising movement among modern female (and even male) hikers: taking to the trail in a specially-designed hiking skirt. Or, as we will soon discuss, the best hiking skirt. If you’ve never even heard of a hiking skirt, you’re not alone. For years, the embodiment of hiker fashion was a somewhat unisex approach of boots, shorts, shirt, hat—and there’s certainly nothing wrong with that. But in recent years, women (and men) have harkened back to the styles of old, donning a skirt as they take to the trailhead. The fad has gathered up an impressive head of steam, and these days there are some truly fetching and functional athletic skirts available in which to tastefully tackle the great outdoors. Like every option available to the modern-day hiker, there are pros and cons associated with choosing a hiking skirt. Let’s take a look at the upsides and downsides of skirt-sporting, as well as examining some of the best options for hiking skirts on the market today. You might not have given it much thought before now, but if you pause to ponder a bit, you can easily come up with a handful of reasons why hiking skirts might be a favorable option on the trail, especially during those scorching summer months. Air Flow. Without the confinement of pants or shorts hugging close to each leg, everything below the waist gets central A/C when you sport a skirt. This is essential for those steamy hot weather hikes, although—as we’ll see in the product reviews—cold weather hiking can be skirt-friendly as well. Ease of Movement. Skirts—especially those made of flexible, stretchable fabric like most hiking skirts are—don’t limit your range of movement. And if your range of movement isn’t limited, then, well, there’s no limit to your movement. Simple as that. Ease of…Answering Nature’s Call. Without going into too much detail, wearing a hiking skirt can make doing your business out in nature a whole lot easier. Yeah. The ladies know what I’m talking about. Piece-of-Cake Maintenance. With an absence of seams and creases, skirts are easily rinsed out after a day on the trail and fully dried by morning. Since when do women’s clothing ever offer up such ease of care? From Trail to Town and Back Again. If you’re planning a day-long excursion that will take you from the wilderness into civilization and you want to dress appropriately and look cute for both, nothing could fit your needs better than a hiking skirt. By choosing a color that hides the dirt well, you can trot right into a restaurant after killing ten miles on the trail and no one will be able to tell you broke a sweat. Speaking of sweat, today’s hiking skirts are experts at wicking sweat and keeping everything at optimal freshness (thanks, in some cases, to Merino wool). For every positive there must be a negative to even out the scale, and in the case of hiking skirts, these are the exceptions that you’ll need to consider before determine if these intrepid togs are for you. This is a big one. With no fabric to buffer your thigh-to-thigh contact, you’re going to have some chafing. Hiking skirt aficionados report, however, that your inner thighs soon toughen up to handle the abrasion, but if that sounds entirely unsavory to you, you might want to move on. The Feasibility of Flashing. Let’s not mince words: skirts make it much easier to accidentally display your business to the world than any other item of clothing, especially if you’re prone to tumbles along the trail. If you’re going to be amongst a pack of people with whom you aren’t incredibly comfortable, you’ll want to consider the possibility of falling in a most ungraceful fashion for everyone to see (and they might see everything). They Like to Move It Move It. Depending on design and user body type, skirts might have a tendency to shift/ride up/turn around during the course of a hike or outdoor activity, and nothing is more annoying than having to adjust your clothing every five seconds to avoid indecent exposure. The Temper of the Trail. If your chosen hiking route is heavy on brush and deadfall and might require a lot of sit-down-and-scoot movement, a skirt might not be your optimal first choice for that particular adventure. Now that you have a good sense of how and when a hiking skirt functions best on any given adventure, let’s take a look at some of the best athletic skirts on the market today. Specific features: The SmartWool Corbet 120 Skirt has wind-resistant panels with a durable water repellent (DWR) finish, SmartLoft wool insulation, quilted construction, Merino wool lining, mid-rise waist, two-way zip-front closure, and welt pocket at right waist. Best use: This skirt is suitable for cold and wet weather hikes, and will keep your legs warm in even the most challenging of conditions. The SmartWool Corbet 120 Skirt provides a perfect fit to allow ease of movement for any activity. The SmartLoft wool insulation (120g)—kept in place by careful quilted construction—will keep your legs toasty warm even while wet, and won’t add too much bulk or weight to the garment. A Merino wool lining resists odors and ensures that moisture will be wicked quickly away, giving you the confidence to wear this skirt all day on the trail and all evening in town. High winds will be deflecting by the panels of wind-resistant durable water repellent (DWR) finish that also resist moisture. With its quality construction and layers of protection against the elements, this skirt makes a smart choice for any adventurer. The lining of the SmartWool Corbet 120 Skirt is a blend of 56% Merino wool and 44% polyester, with a fill of 75% wool and 25% polyester. It is machine washable and should be tumble dried. Related: The SmartWool Women’s Camp House Skirt features all the same benefits of Merino wool in a double-knit fabric that’s perfect for wintery days at the cabin or the campground. Specific features: The Mountain Hardware Trekkin Insulated Knee Skirt has a 30D nylon plain weave fabric body, thermal insulation, snap hem detail, zip security pocket, and knit waistband. Best use: This hiking skirt is built to withstand extremely cold temperatures while looking fashionable enough to transition into urban environments with ease. If you’re looking for a skirt that can pull double (or even triple) duty on the trail, in the city, or on those long treks through multiple days and multiple airports, the Mountain Hardware Trekkin Insulated Knee Skirt is for you. With generous coverage that hits just below the knee, you’ll always be perfectly warm and comfortable no matter where your adventures take you. The body of the Mountain Hardware Trekkin Insulated Knee Skirt is constructed with 30D nylon plain eave, and the Thermal.Q (40 g/m) insulation retains heat even when wet. Thoughtful details of this versatile skirt include a four-snap detail at the hem, a zippered security pocket for stowing keys, ID, or cash, a drop-tail hem that offers extra coverage, and a ultra-comfortable knit waistband that provides ultimate ease of movement. The Mountain Hardware brand is a popular one among outdoor-lovers, with reliable and attractive apparel designed to be at home in any environment. Related: The Mountain Hardwear Trekkin Insulated Mini Skirt has all the quality construction and sharp design of the Mountain Hardware Trekkin Insulated Knee Shirt, but at a shorter length for explorers who don’t require as much coverage or protection from the elements. Specific features: The PrAna Lena Shorts have front zip pockets, back welt pockets, four-way stretch fabric, a fitted waist, zip fly with button closure, and are made from 86% recycled materials. Best use: These stylish and versatile shorts are perfect for demanding hikes but attractive enough to wear on urban adventures or while running errands around town. Yes, that’s right: a pair of shorts has made its way into our “best hiking skirts” list, but that’s just proof of how outstanding the PrAna Lena Shorts are. If you’re not quite sure about making the leap to wearing skirt on the trail, why not start with these durable and beautiful shorts? PrAna Lena Shorts sport soft, lightweight, four-way flex stretch fabric that resists both water and wrinkles. Constructed with 86% recycled polyester and 14% spandex, these shorts meet the bluesign benchmark for a production process vetted as environmentally safe. A wealth of pockets on the front and back panels ensure that you’ll always have a place to stash personal items and these non-bulky shorts can fit easily into your pack or suitcase without adding noticeable weight or volume. 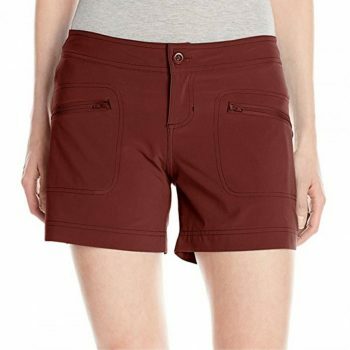 The PrAna Lena Shorts have a relaxed fit and mid-rise waist, are machine washable in cold water, and should be tumble dried on a low setting. Specific features: The Cordillera Snow Flurry Long Down Skirt boasts premium 700 fill-power down for ultimate warmth, a nylon shell, polyester lining, zippered pocket, and a UPF rating of 50. Best use: The Cordillera Snow Flurry Long Down Skirt is perfect for winter hikes and cold weather camping. If you’re looking for a durable skirt to provide substantial warmth and coverage, the Cordillera Snow Flurry Long Down Skirt is for you. 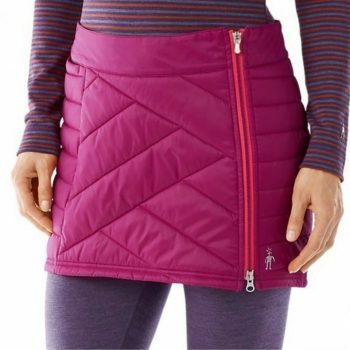 Easily taken on and off with a side zipper, this skirt has premium 700 fill-power down that offers remarkable warmth while not adding too much weight. The nylon shell fabric is wrinkle-resistant, and the 20.5-inch length ensures that your legs will stay warm while still being able to do all they need to do on the trail or at the campsite. A polyester lining creates a compatible surface for layering over tights or leggings, and the sun-protective fabric provides you with a UPF rating of 50. 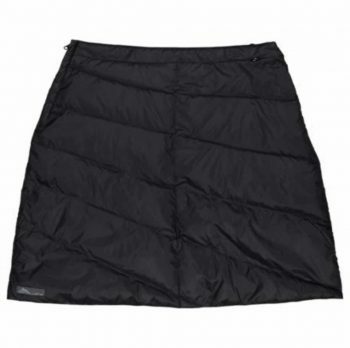 Cold weather adventurers give this skirt high ratings for its stylish design and the high level of protection it offers against the elements. This hiking skirt is one of the toughest you’ll find on the market today. Specific features: The LOLE Women’s Kalenda Skirt is made of chlorine-resistant, UPF 50+ Swim Tech fabric and has mesh-trimmed pockets, a straight hemline, and an interior drawcord at the waistband. Best use: This lightweight skirt is perfect for warm weather adventures including a day at the beach or wading streams on the trail. We’ve spent a lot of time talking about hiking skirts made to brave the cold, blustery gusts of winter, but the LOLE Women’s Kalenda Skirt allows us to set our sights on warmer climes and less extreme environments. This sporty, attractive skirt can take you from a stream-side hike to a beach-front bar while looking great, staying dry, and protecting you from the sun. Constructed from LOLE’s nylon/elastane blend Swim Tech fabric, this skirt resists perspiration, water, sunscreen, and the damaging effects of chlorine. The adjustable waist features an internal drawcord, and mesh-trimmed pockets provide lightweight storage for small items. Both UVA and UVB rays are blocked by its UPF 50+ fabric, and the straight hemline gives all wearers a flattering look as well as free range of movement. The LOLE Women’s Kalenda Skirt can be easily hand washed in cold water, and hung to (quickly) dry, making it the perfect garment for any adventurer on the go. Specific features: The Royal Robbins Jammer Skirt is made of a durable and breathable canvas weave and features an adjustable interior draw-cord at the waist, reinforced barracks at stress points, rivet-reinforced pockets, and UPF 50+ sun protection. Best use: This eco-conscious, lightweight, and quick-drying skort is perfect for hikes or climbs in moderate weather. Bridging the gap between shorts and skirts is the ever-popular skort, which provides you with the coverage and freedom of movement of shorts and the fashionable look of a skirt. 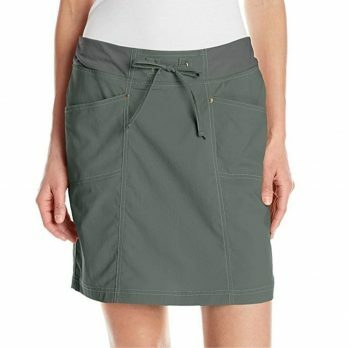 The Royal Robbins Jammer Skirt is a tough little number constructed with an eco-friendly, bluesign-approved canvas weave fabric that is lightweight, dries quickly, resists wrinkles and abrasions, and gives you UPF 50+ sun protection. Reinforced barracks at the garment’s stress points and rivet-reinforced pockets give you the freedom to be as rough and tumble on the trail as you want without worrying that your clothing can’t keep up. A comfortable partial knit waistband hides an internal drawstring that can be easily adjusted for a perfect fit. This skort pulls easily on and off, and is prepared to give you the highest level of performance, durability, protection, comfort, and— of course—style, whether you’re scrambling down a demanding trail, skipping stones along the stream, or running a full docket of weekend errands. 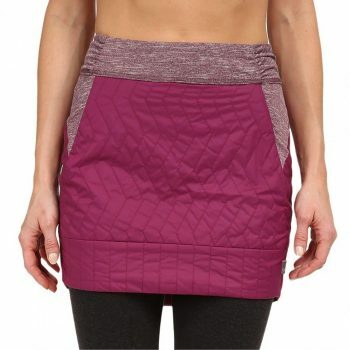 Related: The Royal Robbins Women’s Discovery Skirt is another durable offering from the Royal Robbins designers. The lightweight Discovery stretch nylon won’t wrinkle or retain moisture, making this skort great for travel, summer hikes, or poolside lounging. While a skirt might initially seem like the most counterintuitive wardrobe choice for the trail, many seasoned hikers (men and women alike) swear by these versatile garments for a comfortable trail-to-town experience. Whether the weather is blistering hot or bone-chillingly cold, the rising popularity of hiking skirts have prompted manufacturers to produce hiking skirts perfectly adapted for every activity, environment, or temperature. Even if you aren’t quite ready to make the leap from your usual trail outfit to a heavy-duty hiking skirt, there are plenty of high-quality shorts and skorts to get you thinking outside the box when it comes to your outdoor adventure garb. Do you have any hiking skirts in your wilderness wardrobe rotation? Do you preach the benefits of skirt hiking to your fellow trekkers whenever you can? Are you open to the idea, or are you a hard-core, anti-skirt, pants-or-die adventurer? Share your skirt sentiments, skepticisms, and firsthand skirt stories n the comments!